Reminder : Due to the public holiday, there will be no poker at the Whale and Ale this Monday night! Our newest venue starts this Wednesday night! 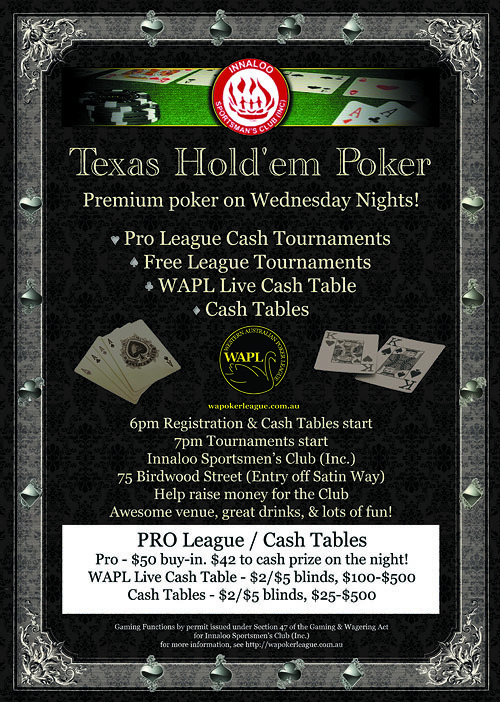 You're welcome to join us at the Innaloo Sportsmen's Club, Inc. opening night on Wed 6th March for Pro League ($50 Freeze-out, $42 back to cash prizes! ), Free League, and Cash Tables! ps. if you're brand new, join us at 6:30pm on the opening night for a Free Tutorial, to get the flow of the game before you jump into the tournament! Gold Rush Main Event Series! 6:00pm registration, 6:45pm seating, 7pm latest start! 6:45pm seating, 7pm latest start! Welcome to the Gold Rush - Here's all the information you need to make your fame and fortune! 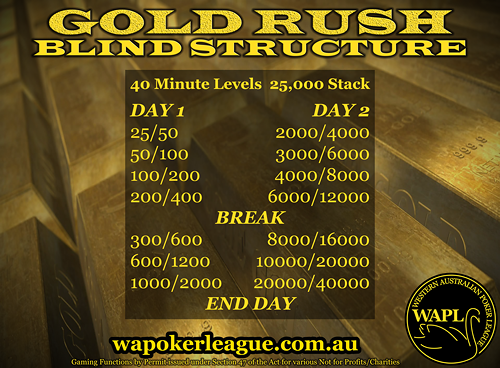 The Gold Rush is a regularly run, dealer dealt Main Event, hosted over 2 days, with a tournament structure which ensures a result that is not rushed, allowing for great poker to be played right to the last hand! You can buy-in directly, or qualify for your $700 Gold Rush seat for as little as $5 via our Flip Rush, which are available at our regular events! These are 4 player, all-in pre-flop "Flips" where the winner gets through! 4 players only! 1 winner! $185 flip wins a $700 Gold Rush Seat! We are really looking forward to rolling this exciting new structure out to our existing and new venues and events, and hope that you enjoy taking part in it as much as we think you will! Please spread the word and help us make this a huge success! 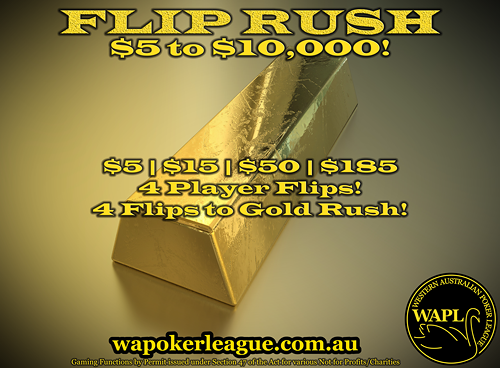 Flip Rush "flips" are individual satellite tournaments which are played all-in pre-flop by 4 players. 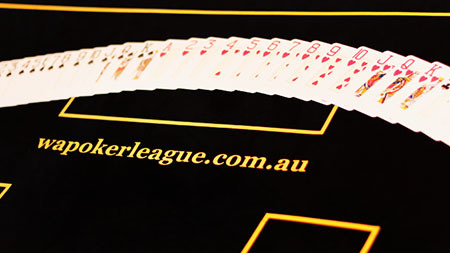 If the hand is split, the players who split play another hand all-in pre-flop, until a winner is determined. Each event you play, your prize winnings (Gold Rush $) will be recorded against your name and held securely. You can contribute to this running record via multiple Flip Rush wins, or top up with cash in order to build up a Gold Rush entrance amount of $700. For example, you may win 2x $50 flips, ($370 total for 2x $185 Flip Rush entries), then elect to use that value from your records, plus $330 cash, to play in the Gold Rush. 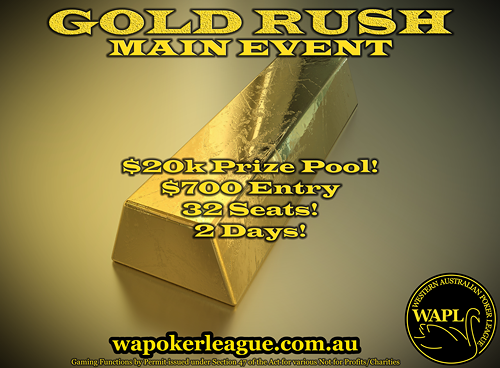 For players who love our Gold Rush structure, and build up Gold Rush Seats faster than we can run the events, players with 2+ Gold Rush Seats recorded ($1400+ value) may also use an extra Gold Rush Seat to buy direct in to our WAPL Live Table for $700, for the ultimate Cash Game experience, streamed online to the world! Super Gold Rush Events will be scheduled occasionally as demand builds at this stage, and these venues and dates will be advised well in advance. Upon such a time that we may decide to cease the Gold Rush Series of events, any outstanding moneys held by the Permit Holding Organisations will be returned to their confirmed winners. All Gaming Functions by Permit issued under Section 47 of the Act for various not for profit organisations. Now we've expanded to live streaming the action from the table, with a 15 minute delay! Make sure you head there and follow us, so you get notified when we go live! Our live games are delayed by 15 minutes, to avoid the potential for viewers to influence hands in play, so that means that for a 6pm-midnight event, you should be able to watch us live from 6:15pm until the end of gaming. 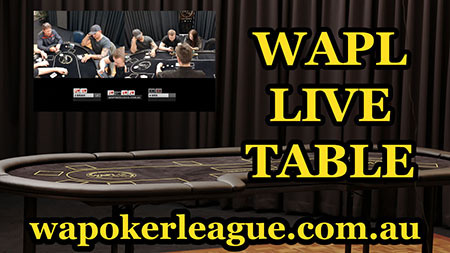 Please get involved, hop into the live chat and give us your comments, suggestions, and any criticisms you might have for us to make the WAPL Live Table experience the best it can be for our viewers, members, and players, and help us spread the word around the local (and wider) poker communities. 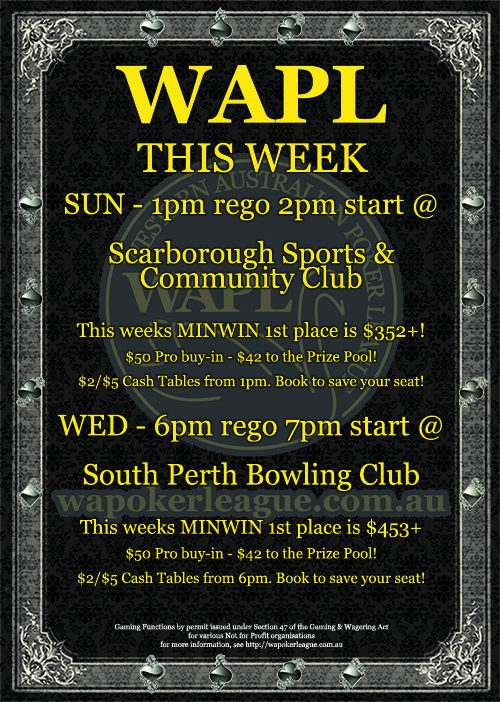 If you want a seat on the WAPL Live Table, email us (info@wapokerleague.com.au) and we will find you a spot, but please be patient as seating is in high demand! WAPL Events are conducted at Gaming Functions by Permit issued under Section 47 of the Act for various charity and not for profit organisations.